There are three winners of the caucuses and primaries on Super Tuesday: Hillary Clinton, Donald Trump and CNN.com. Trump as well as Clinton won 7 states each. CNN.com won the Google News Boxes on this day. We distinguished in our keyword sets between Democrats and Republicans to analyze the publishers ranking in the Google boxes. For each keyword set we considered about 48 keywords, like for example “Hillary Clinton”, “Bernie Sanders” for the Democrats, “Donald Trump”, “Ted Cruz”, “Marco Rubio” for the Republicans and the names of the states (“Alabama Primary”, “Texas Primary”,…) as well as general keywords like “Super Tuesday 2016”, “Super Tuesday polls”, “Super Tuesday results”. As we can see in the following diagrams, there are similar results, especially on the first two ranking positions. 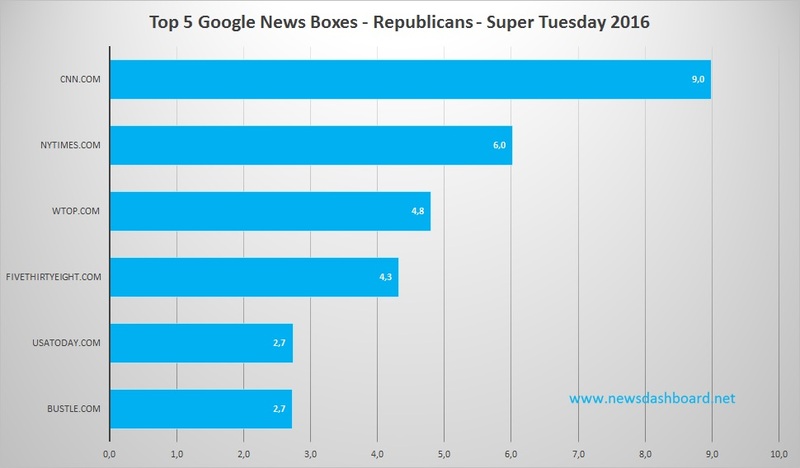 Cnn.com won the Google News Boxes on Super Tuesday 2016 (47 “Republican” Keywords were taken into consideration). 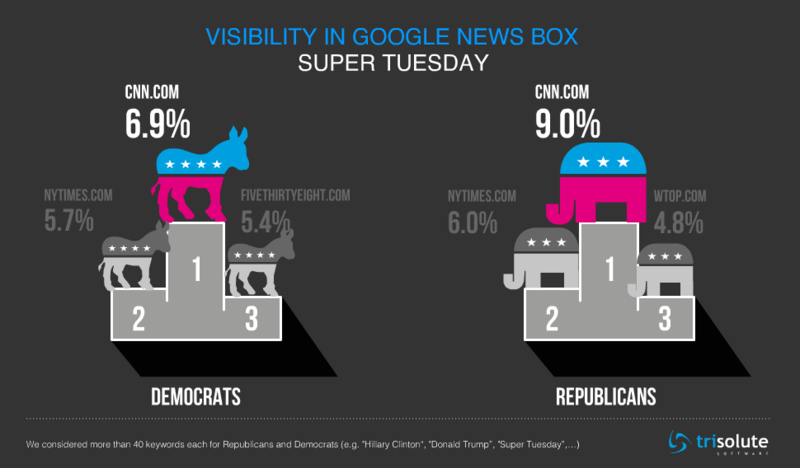 Cnn.com and nytimes.com had the highest Google News Box Visibility on Super Tuesday 2016 (48 “Democratic” Keywords were taken into consideration). 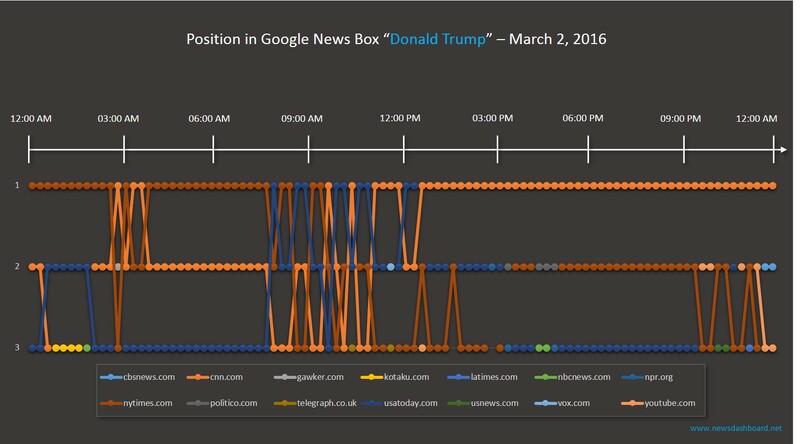 In both cases, cnn.com and nytimes.com are the leaders in the Google News Boxes . But: it is obvious that cnn.com is slightly more successful in “Republican” News Boxes than in “Democratic” ones. As the diagrams show, cnn.com reached 9 percent visibility in the News Boxes regarding the republican keyword set, while in the democratic keyword set, cnn.com just reached 6.9 percent. However, cnn.com still is on the pole position. There are some differences between positions 3 to 5 if we compare both keyword sets. 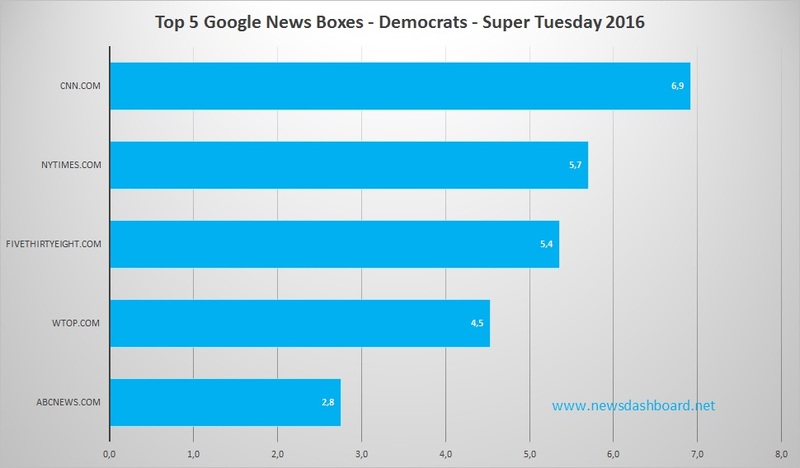 While wtop.com has the third best Google News boxes visibility in the “Republican” keyword set, fivethirtyeight.com won this position in the “Democratic” one. In fact those news publishers changed positions. On fifth position, there is abcnews.com for the “Democrats”. Usatoday.com and bustle.com share position 5 for the “Republicans. 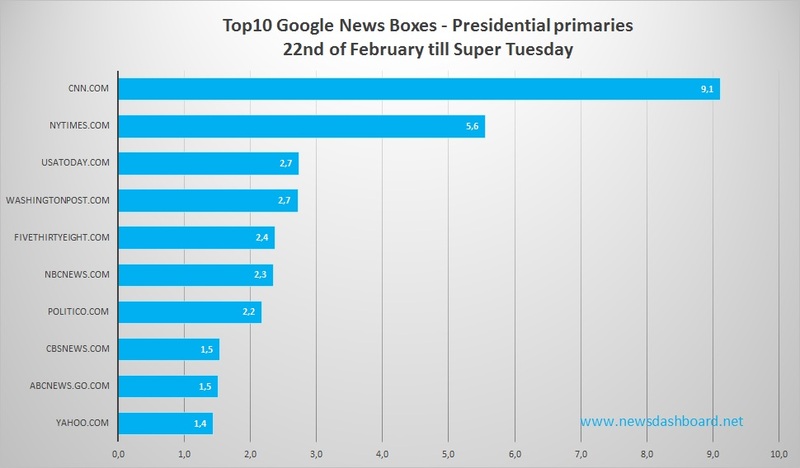 Let´s have a detailed look at the Google News Boxes of the candidates who won most of the primaries and caucuses on Super Tuesday. Are there any differences between the two keywords “Hillary Clinton” and “Hillary Rodham Clinton”? What about “Donald Trump”? Which news publisher could win the Google News Boxes of the candidates for the presidential election? “Hillary Clinton” as well as “Hillary Rodham Clinton” have a similar pattern of publishers ranking in the Google News boxes during the day. As suspected, cnn.com dominates the Google News Boxes – regardless of the spelling of the keyword. That is different than in earlier analyses we did of politician names as keywords. In both cases, cnn.com is on first position most of the day (“Hillary Clinton”: between 10 a.m. and midnight; “Hillary Rodham Clinton: between 9.30 a.m. and midnight). But nevertheless, there are differences between both News Boxes regarding the night before the caucuses and primaries and regarding positions 2 and 3. Between midnight and 6.30 a.m. mcclatchydc.com was on the pole position in the News Box of the keyword “Hillary Clinton”. Afterwards nytimes.com conquered the popular News Box position until cnn.com drove them out. On positions 2 and 3 there is more fluctuation: There are among others usatoday.com, nbcnews.com, freebeacon.com and nytimes.com. In contrast to that there are other news publishers on the 2nd and 3rd position in the “Hillary Rodham Clinton” Google News Box. During the day sites as lgbtqnation.com, telesurtv.net, denverpost.com and people.com could get a spot within the Box. Let´s come to the candidate of the Republicans “Donald Trump”. 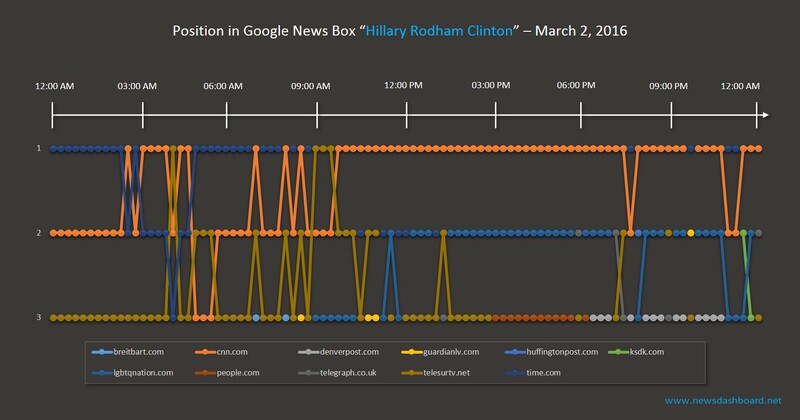 As we can see in the diagram below cnn.com, nytimes.com and usatoday.com are most of time in the Google News Box on Super Tuesday. Between midnight and about 7:30 a.m. nytimes.com hold the 1st position, cnn.com was nearly continuous on 2nd position, usatoday on 3rd. Between 7.30 a.m. and 12.30 p.m. those three publishers alternated on the first three positions. Finally cnn.com won the 1st position of the Google News Box at 12.30 p.m. and stayed there for the rest of the day while the other two players were left behind on positions 2 and 3. Additional to the analysis of the Super Tuesday, we took a look at the development of the election campaigns in the week before Super Tuesday. We decided to look at a time interval between 22nd of February till 1st of March. This time, we considered 87 keywords including all candidates, general keywords about the caucuses and primaries and about the two parties. Cnn.com dominated the Google News Boxes about the presidential candidates and primaries and caucuses. As we can see in the diagram above, cnn.com clearly is also the winner of the Google News Boxes about the presidential debates. 9.1 Percent of all articles in the Google News Boxes were published by cnn.com. 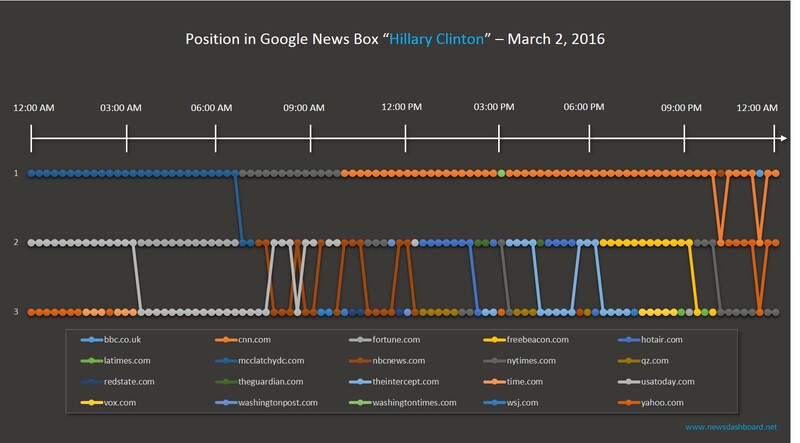 On 2nd position is nytimes.com with 5.6 Percent Google News Visibility in the News Boxes. The following news publishers range between 1.4 and 2.7 percent and are thus not far apart. In summary, beside the named candidates who won the Super Tuesday, on the publisher side it is cnn.com, who won the Super Tuesday.